Special Montenegro stamps for the collection of unpaid or under-paid postage on letter mail, called Postage Due stamps, were first issued in 1894, continuing through 1913. In 1905, a special set of overprinted, commemorative, Postage Due stamps were issued, as a companion to the overprinted, commemorative, postage stamps for the New Constitution celebration. 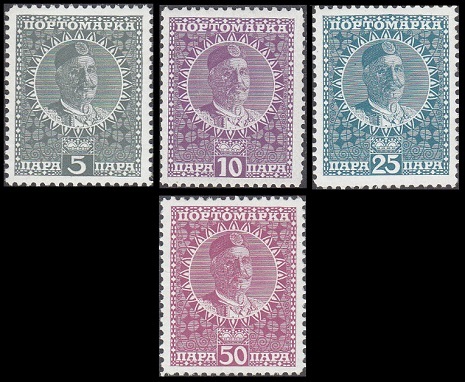 Except for the 1913 issues, which feature a portrait of King Nicola I, all of the Postage Due stamps of Montenegro feature a denomination numeral as their central design. 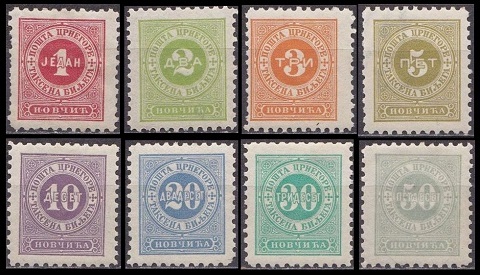 The eight Postage Due stamps shown above were issued in 1894. They are lithographed and perforated 10 1/2, 11, or 11 1/2. 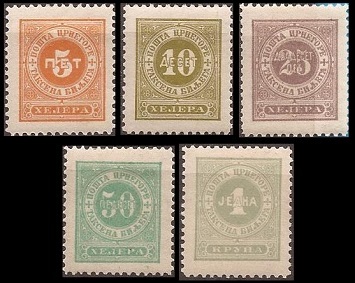 These Montenegro stamps are printed on paper that is watermarked "BRIEF-MARKEN" or "ZEITUNGS-MARKEN" in double-lined capital letters across the middle of each sheet. A single stamp may only show a small portion of a single letter from the watermark, or it may not show any trace of a watermark at all. 01 N. (1894 - Sc. #J1) - Red. 02 N. (1894 - Sc. #J2) - Yellow Green. 03 N. (1894 - Sc. #J3) - Orange. 05 N. (1894 - Sc. #J4) - Olive Green. 10 N. (1894 - Sc. #J5) - Violet. 20 N. (1894 - Sc. #J6) - Ultramarine. 30 N. (1894 - Sc. #J7) - Emerald. 50 N. (1894 - Sc. #J8) - Pale Gray Green. The five Postage Due stamp types of 1894 shown above were issued in 1902, featuring a new currency, color changes, and new denominations. They are unwatermarked and perforated 12 1/2. 05 H. (1902 - Sc. #J9) - Orange. 10 H. (1902 - Sc. #J10) - Olive Green. 25 H. (1902 - Sc. #J11) - Dull Lilac. 50 H. (1902 - Sc. #J12) - Emerald. 01 K. (1902 - Sc. #J13) - Pale Gray Green. 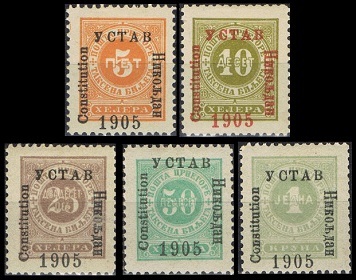 The five Postage Due stamps of 1902 shown above were overprinted in black or red in 1905 to celebrate the new Constitution of the Principality of Montenegro. 05 H. (1905 - Sc. #J14) - Orange (Black). 10 H. (1905 - Sc. #J15) - Olive Green (Red). 25 H. (1905 - Sc. #J16) - Dull Lilac (Black). 50 H. (1905 - Sc. #J17) - Emerald (Black). 01 K. (1905 - Sc. #J18) - Pale Gray Green (Black). The four Postage Due stamps shown above were issued in 1907. They are unwatermarked and perforated 13 x 13 1/2. 05 Pa. (1907 - Sc. #J19) - Red Brown. 10 Pa. (1907 - Sc. #J20) - Violet. 25 Pa. (1907 - Sc. #J21) - Rose. 50 Pa. (1907 - Sc. #J22) - Green. The four Postage Due stamps shown above were issued in 1913. They are unwatermarked and perforated 12 1/2. These stamps are identical to the regular definitive Montenegro stamps of 1913, except for the colors and the inscription at the top. 05 Pa. (1913 - Sc. #J23) - Gray. 10 Pa. (1913 - Sc. #J24) - Violet. 25 Pa. (1913 - Sc. #J25) - Blue Gray. 50 Pa. (1913 - Sc. #J26) - Lilac Rose.